Sunday, June 21st marked National Aboriginal Day in Canada and we were honoured to attend and enjoy a PowWow in a nearby community. It has been one year since the Canadian government made its apology to the native communities for the tragedy of the residential school system and as we gathered with the leadership and participants for the Grand Entry of Eagle Staffs, flags, veterans, dignitaries and dancers we were particularly aware of the history behind us and the need for change before us as communities. Opening speakers spoke of us all as treaty peoples which is such a meaningful way to bring us all to the circle. And as they spoke I could not help but recall the words of the Nippising First Nation Chief from several weeks earlier, anticipating the first anniversary of the apology, when she said she would be wearing her shirt with the number '73' on it~ to honour her father who was taken to residential school, head shaved, punished if he spoke his language and relieved of his name in favour of the number he was called for all his years there, '73'. 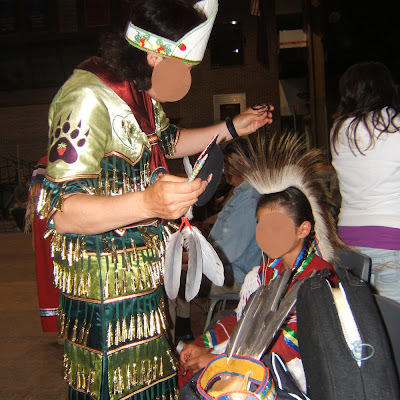 We enjoyed sitting in dancing area and watching the grandmothers dress their grandsons in the traditional garb and little girls with gorgeous butterfly outfits and leather wrapped braids practice their steps (not to mention the crafter's awe for the gorgeous beadwork!). 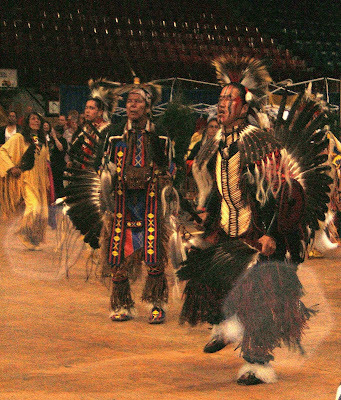 Such positive images of healing as generations gather together and share their culture left me with admiration and hope and a lot of awe for the skill and stamina of dancers from 2 -82! Note the toddler in his dad's arms as dad is drumming! Great pics!! Nice way to celebrate Father's day too.